I purchased this pretty vintage Aynsley teacup trio recently on eBay. visiting with a couple of English men fishing in a pond. I often wish I knew the story that comes with it. or perhaps I will give it to a good friend to make their own story. every teacup has a story. Another gorgeous trio, Linda! I've been browsing eBay teacups a lot lately myself (can you believe I got an eBay gift card for Christmas I haven't spent yet? ), and I can't help noticing those Aynsley sets are real beauties! The quality and design of these pieces are just so lovely! this is a gorgeous Aynsley trio! You are lucky to find the three pieces together. The pattern is vibrant and pretty at the same time. Very nice! Here in the states we don't often see trios. Linda, this set is so charming! I love it. What a sweet addition to the tea table. What a pretty, pretty trio. Aynsley is top notch. Enjoy your cup of tea in your lovely cup and thanks for sharing. The Aynsley trio is pretty Linda and would make afternoon tea a special time. 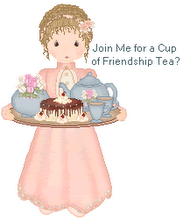 Would love to see your "trio" set at "Friends Sharing Tea" today! Your Aynsley teacup trio is lovely, Linda! How nice that you brought it back from England. I love teacups with stories attached. Makes for a very fun tea time. Thank you for sharing with us and joining me for tea. Have a beautiful week. Sorry, I reread your post and realized you got your set on eBay. It's still beautiful, no matter where you found it! Thanks for sharing. What a Springlike set, Linda! HapPy for your discovery ~ EnJoy! Such a beautiful tea trio! I know you will enjoy drinking tea with it. I too, always wonder about the history of a gently used teacup. I'm glad your trio now has a good home! Another lovely addition to your collection. What fun to "imagine" the tablescapes where the trio was used...what tea filled the teacup and what dainty food sat on the plate. Lovely thoughts! I love the bright colors. Here's to making your tea memories! Very pretty. It seems like I have something Aynsley somewhere. Now going to go look for it.